Looking for something out of the ordinary for your dog's next grooming appointment? There are many styles of grooming that are unusual and stand apart from the normal types of cuts you see every day. This trend started in Asia and has spread to the United States though it's still not very widespread. It is known as the "box cut." The dog's hair around the head is trimmed in a cube shape. In some cases, other areas of the body may be shaped into squares as well to give the dog an overall cube-shaped look. A similar trend that originated in Asia is the round head where the dog's fur is trimmed into a circle shape. It's known in the U.S. as the "circle cut." For a truly stunning and unique look, ask for your dog to have an ombre which is a collection of several colors that blend from one to another. 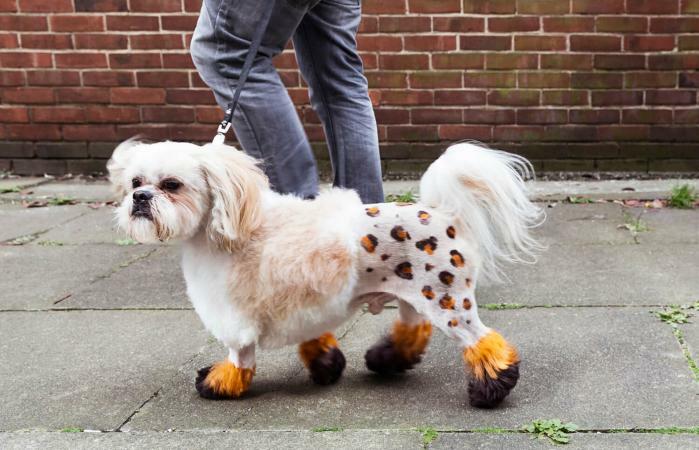 You can have the dog dyed from head to toe, or just do the tails or ears for a slightly more subtle look. If you want to dye your dog's hair, it is extremely important to know what dyes are safe for dogs. Using human hair dye can be very toxic and cause burns to the dog's skin, as well as other severe injuries. VetInfo recommends using non-toxic, non-chemical vegetable hair dyes that are produced specifically for dogs. If your dog has sensitive skin, then dying its fur with any type of dye may not be for you. Asian Freestyle is a term for several styles that have become popular in Asia. Each country has a unique take on it. In Japan, dogs are groomed in a variety of ways, but the goal is to make them look absolutely adorable and fluffy, like a stuffed teddy bear or plush animal toy. This type of grooming can take several hours as it is mostly done with scissors. It also may involve coloring parts of the dog. If you want to try this style out, you will need to find a groomer with experience and training in Japanese-style grooming. Another type of Asian Freestyle is Korean style of grooming which focuses on making the dog cute like a Barbie doll. The style involves adding bows, pigtails, barrettes, flowers, and other decorations, and groomers focus on making the dog's hair long, shiny, and silky. The look is popular with smaller dog breeds such as the Maltese, Shih Tzu, and Yorkshire Terriers. Just as with Japanese style grooming, you should find a groomer experienced with this trend. Many types of Asian Freestyle have made their way to America over the last several years and many groomers in the U.S. can help you with achieving this look for your dog. If you want a punk-inspired look for your dog, why not get him a little mohawk? Some owners will even have their groomers dye the mohawk for a more dramatic effect. Mohawks tend to be done with smaller dog breeds and also Standard Poodles. If you're considering having a groomer give your dog a mohawk, discuss it with them first. Some dogs are not suited for the style based on their type of hair or the sensitivity of their skin to the sun. The Mohawk also requires work on your part to brush or comb your dog's hair regularly to keep the mohawk standing. There are also ways to do a "temporary" mohawk using hair styling products. Always discuss with your groomer your ideas for your dog's look to make sure they are safe and appropriate for your dog's hair and skin. You should also make sure that your dog is comfortable when you take him to the groomer, especially if you're using a new service your dog isn't used to. If you're looking for specialty groomers in your area, you can try the directory for the National Dog Groomers Association and Pet Grooming Finder.